J Unexplored Med Data 2016;1:6-14.10.20517/2572-8180.2016.01© 2016 OAE Publishing Inc.
1Department of Surgery, University Medical Centre Mannheim, Medical Faculty Mannheim of the University of Heidelberg, 68167 Mannheim, Germany. 2Institute of Pathology, University Medical Centre Mannheim, Medical Faculty Mannheim of the University of Heidelberg, 68167 Mannheim, Germany. 3Department of Trauma Surgery, Hannover Medical School, University of Hannover, 30060 Hannover, Germany. 4Day Treatment Center (TTZ), Interdisciplinary Tumor Center Mannheim (ITM) & 3rd Department of Medicine, University Medical Centre Mannheim, Medical Faculty Mannheim of the University of Heidelberg, 68167 Mannheim, Germany. Until recently, the standard treatment for gastroesophageal adenocarcinoma had been primary surgery. In the light of the mentioned poor long-term survival; several trials have assessed the potential benefit of neoadjuvant chemotherapy and chemoradiotherapy. [7-11] A recent meta-analysis of these trials has demonstrated that neoadjuvant therapy confers a relevant survival benefit for patients with gastroesophageal adenocarcinoma. Gastroesophageal resections bear a non-negligible risk of perioperative morbidity with anastomotic leakage and pulmonary complications[14,15] being the most dreaded complications. The mentioned meta-analysis did not show elevated perioperative morbidity in patients who received neoadjuvant treatment. However, there might be common biological pathways leading to both response to chemotherapy and complications. Examples are higher tissue sensitivity and more pronounced immunosuppression. Thus, better response to neoadjuvant therapy might be associated with a higher risk for perioperative morbidity. In fact, a study showed increased perioperative morbidity in patients with rectal cancer who had a good response to neoadjuvant chemoradiotherapy. Conversely, non-responders might be more prone to perioperative complications because of perpetuated malnutrition or general physical deterioration due to tumor progression. The aim of this study was to assess potential associations between response to neoadjuvant therapy and perioperative morbidity in patients with gastroesophageal adenocarcinoma. A prospectively maintained institutional database containing all patients undergoing resection for adenocarcinoma of the esophagus, gastroesophageal junction, or stomach was reviewed. From this database, we selected all patients who had received preoperative chemotherapy or chemoradiotherapy and for whom histopathological specimens were available for regression grading. Neoadjuvant chemotherapy is the standard of care in our hospital for patients with locally advanced gastroesophageal adenocarcinoma, who have no medical contraindications against neoadjuvant treatment, since 2006. In selected cases, and in some cases referred from other institutions, neoadjuvant chemoradiotherapy instead of chemotherapy alone is applied. Of 133 patients with gastroesophageal adenocarcinoma who underwent resection between January 2006 and January 2011, the closing date of our database, 60 (45.1%) received neoadjuvant chemotherapy and 1 (0.8%) neoadjuvant chemoradiotherapy. In all patients, the diagnosis of adenocarcinoma was confirmed by upper endoscopy and biopsies, while computerized tomography of the chest and abdomen, endoscopic ultrasound (EUS) and magnetic resonance imaging of the liver in case of suspected liver metastases were used for clinical staging. The treatment strategy for each patient was determined in a multidisciplinary tumor board after completion of staging was completed. Usually, neoadjuvant chemotherapy was recommended for patients with computed tomography (CT) stage 3 or higher and/or with suspicion of nodal disease on EUS and CT staging, unless they were deemed medically unfit for neoadjuvant treatment or tumor stenosis or bleeding required immediate surgery. If the decision for neoadjuvant therapy was made, it was started as soon as possible. The applied chemotherapy scheme was determined by the treating oncologist according to clinical characteristics and comorbidities of the patient as well as eligibility for clinical trials. After completion of chemotherapy, all patients were restaged and underwent surgery, which was scheduled 4 to 6 weeks after the last dose of chemotherapy. The type of surgery performed depended on the location and extent of the tumor and the judgment of the operating surgeon. In patients which based on assessment of their pulmonary function, comorbidities and performance status were judged suitable for a transthoracic approach, adenocarcinomas of the esophagus (Siewert type 1 tumors) were treated with an Ivor Lewis operation or a hybrid approach using thoracoscopy, laparotomy and cervical anastomosis, performing 2-field lymphadenectomy and reconstruction with a gastric conduit. Siewert type 2 and 3 tumors were treated with gastrectomy, D2-lymphadenectomy and transhiatal distal esophageal resection with esophagojejunostomy and Roux-en-Y reconstruction. Stomach cancers were treated with total or subtotal gastrectomy and D2-lymphadenectomy with esophagojejunostomy and Roux-en-Y reconstruction. Postoperative treatment was again decided in a multidisciplinary tumor board. For medically fit patients, postoperative continuation of chemotherapy was usually recommended and started 4 to 6 weeks after resection. All perioperative and postoperative complications which occurred during the operation or the subsequent hospital stay were prospectively collected in the database and classified according to the five-tier scheme proposed by Clavien et al. For all patients, the American Society of Anesthesologists (ASA) score and the Physiological and Operative Severity Score for the enUmeration of Morbidity and mortality (POSSUM) score were determined according to respective recommendations. Moreover, the applied chemotherapy regimen as well as relevant perioperative laboratory parameters were extracted from the database. Resection specimens were histopathologically analyzed by an experienced glycemic index pathologist and evaluated according to a standardized protocol. The recognizable tumor area was measured, and the entire tumor or scar area was cross-sectioned in 5 mm intervals. The material was paraffin embedded by routine protocol and the sections stained with hematox-ylin&eosin and periodic Acid-Schiff stain. Immunohistochemistry for cytokeratins was performed if tumor cells were not recognizable by routine staining. The resection margins, other areas of esophagus and stomach, and the lymph nodes were examined according to the tumor node metastasis (TNM) staging system. All cases prior to 2010 were restaged after implementation of the 7th edition of the TNM classification in January 2010. Histopathological tumor response to neoadjuvant therapy was assessed via regression grading as proposed by Becker et al. In brief, tumors with no viable cells are assigned grade Ia, tumors with 1-10% viable cells grade Ib; tumors with 10-50% viable cells grade II and tumors with more than 50% of viable cells grade III. For the purpose of this study, patients were dichotomised into responders (grade Ia-II) and non-responders (grade III). Stata version 12 (Stata Corp, College Station, Texas, USA) was employed for data analysis. Variables were analyzed using contingency tables and 2-tailed χ² test, or Fisher’s exact test when single cells contained 5 or less observations. P-values below 0.05 were regarded as statistically significant. A total of 61 patients (37 males and 24 females) with a median age of 61.9 (range 32-83), underwent resection of gastroesophageal adenocarcinoma after neoadjuvant chemotherapy or chemoradiotherapy during the study period. There were 37/61 (60.7%) responders (Becker grade Ia-II) and 24/61 (39.3%) non-responders (Becker grade III). Patient characteristics for the whole study population, and separately for responders and non-responders, are displayed in Table 1. Fifty-seven over sixty-one patients (93.4%) had a microscopically complete (R0) resection of the tumor; four over sixty-one patients (6.6%) had an incomplete resection (R1). All 4 patients with incomplete resection had Union for International Cancer Control (UICC) tumor stage III. The majority of patients (39.3%) received an epirubicin/platinum-based chemotherapy scheme, followed by 29.5% of patients who received a taxane/platinum-based regimen. One patient received chemoradiotherapy (cisplatin, 5-fluorouracil, 36 Gy). The majority of patients (80.3%) were anaemic before surgery. With the exception of UICC stage, which was lower in responders, there were no significant differences between the 2 groups. All perioperative complications are listed in Table 2. Twenty-four over sixty-one patients (39.3%) were without any complication. A total of 58 perioperative complications occurred in 37/61 patients (60.7%) during their hospital stay. Four over sixty-one patients (6.6%) had a complication of grade I according to the Clavien-Dindo classification; twelve over sixty-one patients (19.7%) grade II; eleven over sixty-one patients (18.0%) grade IIIa; two over sixty-one patients (3.3%) grade IIIb; two over sixty-one patients (3.3%) grade IVa and 3/61 patients (4.9%) grade IVb. Three over sixty-one patients (4.9 %) died due to complications (grade V). Two of these deaths were due to septic multiorgan failure and one due to presumed sudden cardiac death. Intraoperative complications occurred in 5/61 patients (7.7%; bleeding in 3 patients and damage of adjacent structures in 2 patients). The most frequent postoperative complications were pulmonary: pneumonia (9.8%), pleural effusion (16.4%), pneumothorax (6.6%), and respiratory failure (8.2%). Anastomotic leakage occurred in 5 patients (7.7%); in one patient leakage was due to ischemia resulting in necrosis of the gastric conduit. Table 3 compares characteristics of patients who suffered at least one complication (Clavien-Dindo grade I and higher) with those who remained free of complications. Patients who suffered complications were more often anaemic at the time of surgery. Patients undergoing esophagectomy had a significantly higher risk of complication compared with those who underwent gastrectomy. There was a non-significant trend towards a higher probability of complications in patients who had macroscopically incomplete resection; an ASA score of 3; a higher POSSUM score and lower albumin levels upon resection. The distribution of the single complication grades among responders and non-responders is depicted in Figure 1. The proportion of patients with at least one perioperative complication was higher among non-responders (17/24; 70.8%) than responders (20/37; 54.1%; P = 0.19). For all other strata of complication grades, the proportion was higher among non-responders. In the strata of Clavien-Dindo grades I/II and III/IV, there were proportionally more non-responders than responders. 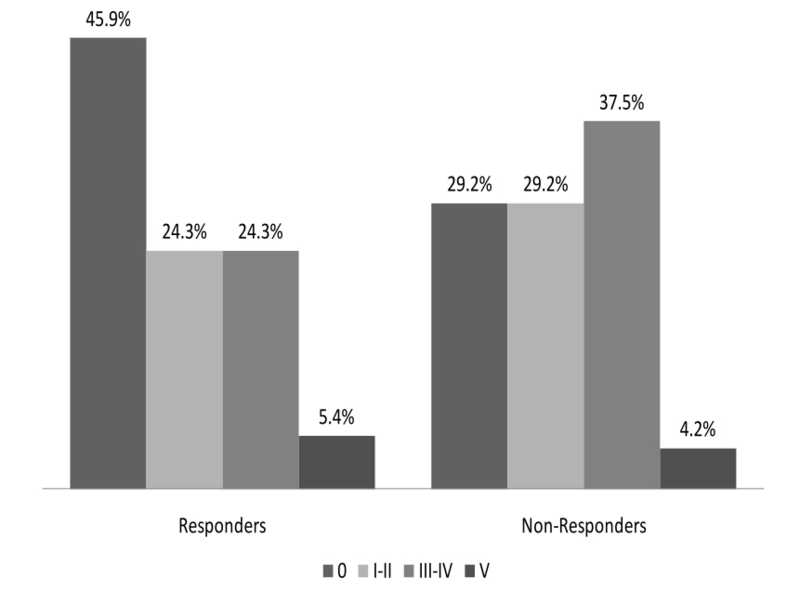 Perioperative death (complication grade V) occurred in 2 responders and 1 non-responder. When looking at specific complications (not shown in Figure), there was a higher proportion of anastomotic leakage among non-responders (4/24; 16.7%) than responders (1/37; 2.7%; Fisher’s test: P = 0.07). Regarding the incidence of pulmonary complications, there was no difference between non-responders (11/24; 45.8%) and responders (13/37; 35.1%; P = 0.57). To our knowledge, this is the first study which assesses a possible association between tumor response to neoadjuvant chemotherapy and postoperative morbidity in patients undergoing resection of gastroesophageal adenocarcinoma. The results fail to demonstrate a significant association of response and morbidity. However, there is a borderline significant elevation of the risk of suffering an anastomotic leakage for non-responders, whereas for pulmonary complications, which in itself are the most frequent morbidity after resection of pretreated gastroesophageal adenocarcinoma, there is no tangible difference in risk between responders and non-responders. A similar study has been conducted in patients with rectal cancer. Horisberger et al. showed that patients with a good response to neoadjuvant intensified chemoradiotherapy had an increased risk for postoperative complications, in line with findings from Tsujinaka et al. who found responders to radiotherapy without concomitant chemotherapy to be at an elevated risk of renal/genitourinary complications. In the study by Horisberger et al. the difference was largely driven by a much higher incidence of anastomotic leakage in responders (25.9% compared to zero in non-responders). Supposed reasons were a stronger inhibition of wound and anastomotic healing due to irritated bowel mucosa and decreased leukocyte function in patients who had a good response as opposed to non-responders. These results are diametrically opposed to our findings. The reasons for these different patterns between the 2 tumor entities are not clear. One possible explanation is that patients with gastroespohageal cancers are more often in poor nutritional and overall physical conditions due to dysphagia and consecutive weight loss than rectal cancer patients. Although there are some contradictory studies, preoperative nutritional and physical deterioration is regarded as a risk factor for complications after resection of gastroesophageal tumors. [23,24] In fact, we found a trend towards more complications in patients with low preoperative albumin levels. This finding is corroborated by a study from Korea showing a markedly higher complication rate in hypoalbuminemic patients undergoing gastric surgery. Responders to preoperative chemotherapy tend to experience alleviation of symptoms, gain body weight and improve their overall physical status. Consequently, they might have a lower risk of perioperative complications as compared to non-responders. However, histopathological response is not always paralleled by endoluminal tumor shrinkage and thus improvement in ability to swallow and eat. Another potential reason for the different association of response and perioperative morbidity between gastroesophageal and rectal adenocarcinoma is the kind of neoadjuvant treatment patients undergo. In the study by Horisberger et al. all patients received capecitabine, irinotecan and optionally cetuximab, combined with concurrent radiotherapy. In contrast, in our study only one patient underwent chemoradiotherapy, and chemotherapy regimens were based on a combination of 5-FU and platinum, which in eligible patients was combined with either epirubicin or docetaxel. It is conceivable that higher local radiation sensitivity is linked to sustained tissue vulnerability and thus predisposes to anastomotic leakage, which was the only specific complication with a significantly higher incidence among responders in the study among rectal cancer patients. Such tissue vulnerability might not be induced in chemotherapy schemes without radiotherapy. Our study has a number of methodological limitations. Its sample size and thus statistical power might have been too low to detect an existing association between chemotherapy response and incidence of complications. This lack of power becomes even more evident when evaluating specific complications. The study uses a retrospective analysis of data, which however have been prospectively collected and stored in a database. For the given research question, a prospective and controlled trial design is obviously not feasible. Although the regression grading system proposed by Becker et al. is commonly recognized and validated to predict survival, the dichotomization we used is not. It seemed, however, a rational approach for analysis given the relatively small sample size. Moreover, our study population is somewhat heterogeneous, as different chemotherapy schemes were used for preoperative therapy. Likewise, although gastroesophageal adenocarcinoma is readily regarded as one oncological entity, from a surgical point of view an esophagectomy is different from a gastrectomy and bears a higher risk of complications. However, we aimed at assessing a group effect of neoadjuvant chemotherapy for this tumor entity, which we deem a rational approach from a clinical perspective. The strength of our study is that it comprises all consecutive patients with gastroesophageal adenocarcinoma who were resected after neoadjuvant therapy in our institution and thus excludes any selection bias. It uses validated scores both to assess surgical complications and, with the limitation described above, histopathological response. In conclusion, this study, which for the first time assessed the association between histopathological response and the risk of postoperative complications in patients undergoing resection of gastroesophageal adenocarcinoma after neoadjuvant chemotherapy, could not find a difference in risk between responders and non-responders. There was however a borderline significant trend towards a higher risk of anastomotic leakage in non-responders. This finding should be kept in mind by surgeons and oncologists when treating such patients. As the power of this study was rather low, we suggest that future studies comprising larger patient populations possibly pooled from several institutionsare conducted. Since this was a retrospective study without any direct patient contact. The need for patient consent was waived. Since this was a retrospective study without any direct patient contact. The need for ethics committee approval was waived. 1. Marsman WA, Tytgat GN, ten Kate FJ, van Lanschot JJ. Differences and similarities of adenocarcinomas of the esophagus and esophagogastric junction. J Surg Oncol 2005;92:160-8. 2. Chau I, Norman AR, Cunningham D, Oates J, Hawkins R, Iveson T, Nicolson M, Harper P, Seymour M, Hickish T. The impact of primary tumour origins in patients with advanced oesophageal, oesophago-gastric junction and gastric adenocarcinoma--individual patient data from 1775 patients in four randomised controlled trials. Ann Oncol 2009;20:885-91. 3. Gallo A, Cha C. Updates on esophageal and gastric cancers. World J Gastroenterol 2006;12:3237-42. 4. Krejs GJ. Gastric cancer: epidemiology and risk factors. Dig Dis 2010;28:600-3. 5. Hagen JA, DeMeester SR, Peters JH, Chandrasoma P, DeMeester TR. Curative resection for esophageal adenocarcinoma: analysis of 100 en bloc esophagectomies. Ann Surg 2001;234:520-30. 6. Siewert JR, Bottcher K, Stein HJ, Roder JD. Relevant prognostic factors in gastric cancer: ten-year results of the German Gastric Cancer Study. Ann Surg 1998;228:449-61. 7. Allum WH, Stenning SP, Bancewicz J, Clark PI, Langley RE. Long-term results of a randomized trial of surgery with or without preoperative chemotherapy in esophageal cancer. J Clin Oncol 2009;27:5062-7. 8. Burmeister BH, Smithers BM, Gebski V, Fitzgerald L, Simes RJ, Devitt P, Ackland S, Gotley DC, Joseph D, Millar J, North J, Walpole ET, Denham JW. Surgery alone versus chemoradiotherapy followed by surgery for resectable cancer of the oesophagus: a randomised controlled phase III trial. Lancet Oncol 2005;6:659-68. 9. Cunningham D, Allum WH, Stenning SP, Thompson JN, van de Velde CJ, Nicolson M, Scarffe JH, Lofts FJ, Falk SJ, Iveson TJ, Smith DB, Langley RE, Verma M, Weeden S, Chua YJ, MAGIC Trial Participants. Perioperative chemotherapy versus surgery alone for resectable gastroesophageal cancer. N Engl J Med 2006;355:11-20. 10. Hartgrink HH, Van de Velde CJ, Putter H, Songun I, Tesselaar ME, Kranenbarg EK, de Vries JE, Wils JA, van der BJ, van Krieken JH. Neoadjuvant chemotherapy for operable gastric cancer: long term results of the Dutch randomised FAMTX trial. Eur J Surg Oncol 2004;30:643-9. 11. Kelsen DP, Winter KA, Gunderson LL, Mortimer J, Estes NC, Haller DG, Ajani JA, Kocha W, Minsky BD, Roth JA, Willett CG. Long-term results of RTOG trial 8911 (USA Intergroup 113): a random assignment trial comparison of chemotherapy fol-lowed by surgery compared with surgery alone for esophageal cancer. J Clin Oncol 2007;25:3719-25. 12. Ronellenfitsch U, Schwarzbach M, Hofheinz R, Kienle P, Kieser M, Slanger TE, Burmeister B, Kelsen D, Niedzwiecki D, Schuhmacher C, Urba S, van de Velde C, Walsh TN, Ychou M, Jensen K. Preoperativechemo (radio) therapy versus primary surgery for gastroesophageal adenocarcinoma: systematic review with meta-analysis combining individual patient and aggregate data. Eur J Cancer 2013;49:3149-58. 13. Urschel JD. Esophagogastrostomy anastomotic leaks complicating esophagectomy: a review. Am J Surg 1995;169:634-40. 14. Whooley BP, Law S, Murthy SC, Alexandrou A, Wong J. Analysis of reduced death and complication rates after esophageal resection. Ann Surg 2001;233:338-44. 15. Law S, Wong KH, Kwok KF, Chu KM, Wong J. Predictive factors for postoperative pulmonary complications and mortality after esophagectomy for cancer. Ann Surg 2004;240:791-800. 16. Horisberger K, Hofheinz RD, Palma P, Volkert AK, Rothenhoefer S, Wenz F, Hoch-haus A, Post S, Willeke F. Tumor response to neoadjuvant chemoradiation in rectal cancer: predictor for surgical morbidity? Int J Colorectal Dis 2008;23:257-64. 17. Heidecke CD, Weighardt H, Feith M, Fink U, Zimmermann F, Stein HJ, Siewert JR, Holzmann B. Neoadjuvant treatment of esophageal cancer: Immunosuppression following combined radiochemotherapy. Surgery 2002;132:495-501. 18. Dindo D, Demartines N, Clavien PA. Classification of surgical complications: a new proposal with evaluation in a cohort of 6336 patients and results of a survey. Ann Surg 2004;240:205-13. 19. Copeland GP, Jones D, Walters M. POSSUM: a scoring system for surgical audit. Br J Surg 1991;78:355-60. 20. Sobin LH, Gospodarowicz MK, Wittekind C. UICC: TNM classification of malignant tumors, 7th ed. Oxford: Wiley-Blackwell; 2009. 21. Becker K, Mueller JD, Schuhmacher C, Ott K, Fink U, Busch R, Böttcher K, Siewert JR, Höfler H. Histomorphology and grading of regression in gastric carcinoma treated with neoadjuvant chemotherapy. Cancer 2003;98:1521-30. 22. Tsujinaka S, Kawamura YJ, Konishi F, Aihara H, Maeda T, Mizokami K. Long-term efficacy of preoperative radiotherapy for locally advanced low rectal cancer. Int J Colorectal Dis 2008;23:67-76. 23. Watanabe M, Iwatsuki M, Iwagami S, Ishimoto T, Baba Y, Baba H. Prognostic nutritional index predicts outcomes of gastrectomy in the elderly. World J Surg 2012;36:1632-9. 24. Garth AK, Newsome CM, Simmance N, Crowe TC. Nutritional status, nutrition practices and post-operative complications in patients with gastrointestinal cancer. J Hum Nutr Diet 2010;23:393-401. 25. Bae HJ, Lee HJ, Han DS, Suh YS, Lee YH, Lee HS, Cho JJ, Kong SH, Yang HK. Prealbuminlevels as a useful marker for predicting infectious complications after gastric surgery. J Gastrointest Surg 2011;15:2136-44. 26. Rizk NP, Bach PB, Schrag D, Bains MS, Turnbull AD, Karpeh M, Brennan MF, Rusch VW. The impact of complications on outcomes after resection for esophageal and gastroesophageal junction carcinoma. J Am Coll Surg 2004;198:42-50. 27. Sierzega M, Kolodziejczyk P, Kulig J; Polish Gastric Cancer Study Group. Impact of anastomotic leakage on long-term survival after total gastrectomy for carcinoma of the stomach. Br J Surg 2010;97:1035-42. 28. Yoo HM, Lee HH, Shim JH, Jeon HM, Park CH, Song KY. Negative impact of leakage on survival of patients undergoing curative resection for advanced gastric cancer. J Surg Oncol 2011;104:734-40. 29. Lo CH, Chen JH, Wu CW, Lo SS, Hsieh MC, Lui WY. Risk factors and management of intraabdominal infection after extended radical gastrectomy. Am J Surg 2008;196:741-5. 30. Tsou CC, Lo SS, Fang WL, Wu CW, Chen JH, Hsieh MC, Shen KH. Risk factors and management of anastomotic leakage after radical gastrectomy for gastric cancer. Hepatogastroenterology 2011;58:218-23. 31. Turkyilmaz A, Eroglu A, Aydin Y, TekinbasC, Muharrem EM, Karaoglanoglu N. The management of esophagogastric anastomotic leak after esophagectomy for esophageal carcinoma. Dis Esophagus 2009;22:119-26. 32. Ng T, Vezeridis MP. Advances in the surgical treatment of esophageal cancer. J Surg Oncol 2010;101:725-9. 33. Lordick F, Ott K, Krause BJ, Weber WA, Becker K, Stein HJ, Lorenzen S, Schuster T, Wieder H, Herrmann K, Bredenkamp R, Hofler H, Fink U, Peschel C, Schwaiger M, Siewert JR. PET to assess early metabolic response and to guide treatment of adenocarcinoma of the oesophagogastric junction: the MUNICON phase II trial. Lancet Oncol 2007;8:797-805. 34. Ott K, Sendler A, Becker K, Dittler HJ, Helmberger H, Busch R, Kollmannsberger C, Siewert JR, Fink U. Neoadjuvant chemotherapy with cisplatin, 5-FU, and leucovorin (PLF) in locally advanced gastric cancer: a prospective phase II study. Gastric Cancer 2003;6:159-67. 35. Sloof GW. Response monitoring of neoadjuvant therapy using CT, EUS, and FDG-PET. Best Pract Res Clin Gastroenterol 2006;20:941-57. 36. Schneider PM, Metzger R, Schaefer H, Baumgarten F, Vallbohmer D, Brabender J, Wolfgarten E, Bollschweiler E, Baldus SE, Dienes HP, Hoelscher AH. Response evaluation by endoscopy, rebiopsy, and endoscopic ultrasound does not accurately predict histopathologic regression after neoadjuvant chemoradiation for esophageal cancer. Ann Surg 2008;248:902-8. 37. Shimada H, Okazumi S, Koyama M, Murakami K. Japanese Gastric Cancer Association Task Force for Research Promotion: clinical utility of (1) (8) F-fluoro-2-deoxyglucose positron emission tomography in gastric cancer.A systematic review of the literature. Gastric Cancer 2011;14:13-21. 38. Moehler M, Al-Batran SE, Andus T, Anthuber M, Arends J, Arnold D, Aust D, Baier P, Baretton G, Bernhardt J, Boeing H, Böhle E, Bokemeyer C, Bornschein J, Budach W, Burmester E, Caca K, Diemer WA, Dietrich CF, Ebert M, Eickhoff A, Ell C, Fahlke J, Feussner H, Fietkau R, Fischbach W, Fleig W, Flentje M, Gabbert HE, Galle PR, Geissler M, Gockel I, Graeven U, Grenacher L, Gross S, Hartmann JT, Heike M, Heinemann V, Herbst B, Herrmann T, Höcht S, Hofheinz RD, Höfler H, Höhler T, Hölscher AH, Horneber M, Hübner J, Izbicki JR, Jakobs R, Jenssen C, Kanzler S, Keller M, Kiesslich R, Klautke G, Körber J, Krause BJ, Kuhn C, Kullmann F, Lang H, Link H, Lordick F, Ludwig K, Lutz M, Mahlberg R, Malfertheiner P, Merkel S, Messmann H, Meyer HJ, Mönig S, Piso P, Pistorius S, Porschen R, Rabenstein T, Reichardt P, Ridwelski K, Röcken C, Roetzer I, Rohr P, Schepp W, Schlag PM, Schmid RM, Schmidberger H, Schmiegel WH, Schmoll HJ, Schuch G, Schuhmacher C, Schütte K, Schwenk W, Selgrad M, Sendler A, Seraphin J, Seufferlein T, Stahl M, Stein H, Stoll C, Stuschke M, Tannapfel A, Tholen R, Thuss-Patience P, Treml K, Vanhoefer U, Vieth M, Vogelsang H, Wagner D, Wedding U, Weimann A, Wilke H, Wittekind C; AWMF; AWMF. [German S3-guideline "Diagnosis and treatment of esophagogastric cancer"]. Z Gastroenterol 2011;49:461-531. 39. Palmes D, Bruwer M, Bader FG, Betzler M, Becker H, Bruch HP, Büchler M, Buhr H, Ghadimi BM, Hopt UT, Konopke R, Ott K, Post S, Ritz JP, Ronellenfitsch U, Saeger HD, Senninger N; German Advanced Surgical Treatment Study Group. Diagnostic evaluation, surgical technique, and perioperative management after esophagectomy: consensus statement of the German Advanced Surgical Treatment Study Group. Langenbecks Arch Surg 2011;396:857-66. 40. Langer R, Ott K, Feith M, Lordick F, Siewert JR, Becker K. Prognostic significance of histopathological tumor regression after neoadjuvant chemotherapy in esophageal adenocarcinomas. Mod Pathol 2009;22:1555-63.